... try, try again. Isn't that the truth! One of my favorite vehicles for pesto is homemade potato gnocchi (pronounced NYO-key). The ridges created by the gnocchi board - or the tines of a fork - provide the perfect nooks and crannies for catching all that basil-y goodness, augmented by pine nuts and Parmigiano-Reggiano. The pesto making is easy.... but not so much the gnocchi! My first foray into gnocchi making was a true disaster. I found a recipe for pumpkin gnocchi in an Italian cookbook and wanted to make them for my friend Susan (principal cellist of the Albany Symphony Orchestra) and her boyfriend, as she had given me the book for my birthday. Never being shy about testing recipes on friends, I forged ahead. The recipe said to mix the pumpkin with flour and egg until a soft dough forms, adding "1 or 2 tablespoons of flour" so that the dough isn't too soft. Never having done this, I made some not very good assumptions about what "soft dough" meant. I kept adding flour until it felt, to me, like a decent "soft dough." I set them on waxed paper to rest and went about making a brown butter sauce with sage. I then boiled them following the instructions and they floated to the surface as promised. I bathed them in brown butter and sage, and presented them proudly at the table with slivers of smoked ricotta cheese. First bite... Rubber? No, wait... more like silicon. They were truly awful. I offered to take the plates and make something else but they, being ever so polite, kept on eating the little doorstops and exclaiming that the "flavor" was wonderful (even if the texture worried them in terms of future digestive issues...). My second attempt was not much better. Mark and I were in Montalcino, Tuscany, with a group of friends - about 12 in all. His cousin Cathy offered to make her famous vodka sauce and I volunteered to make gnocchi. Knowing my prior mistake of adding too much flour, I assumed a tweak here and there would take care of it. Little did I know that the opposite of "too much flour" yields an even less-satisfying result. Again, they looked great before being cooked but once they hit the water, many of them fell to pieces creating starchy potato water. Enough dumplings survived to feed the masses but I can still feel the sting of failure even today. Recently, San Diego friends David and David visited us in Arizona. One of the Davids (I will keep this simple) is a CIA (Culinary Institute of America) graduate, and I asked his help in getting my gnocchi to the right consistency. With David's expertise, suddenly perfect gnocchi were no longer a dream to chase. The advice? Knead the dough gently and get it to the point where it feels "silky" or "satiny" as it would for any bread dough - and when you poke it with your finger, the indent lingers a bit and springs back somewhat simultaneously. Voila! 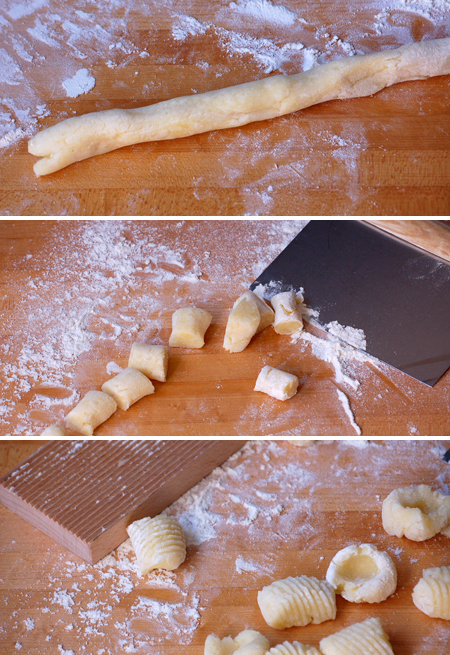 The rolling of the gnocchi was also a mystery for a while but, once I saw it happen, it made perfect sense. Check out the photo sequence above (thanks to Mark!) and, if using the tines of a fork, follow the same directions. I tend to make a lot at once and then freeze them on a cookie sheet lined with parchment. Once frozen, I put them in freezer bags and take them out as needed. One more secret to making perfect gnocchi: don't crowd the pot when boiling them. Adding too many at once, especially if frozen, will lower the water temperature, they won't boil properly and they will fall apart. I like to serve regular gnocchi with either a simple basil pesto or with brown butter, sage and Parmigiano-Reggiano. It is also traditional to serve them with a tomato sauce, and I particularly like Marcella Hazan's buttery tomato sauce. 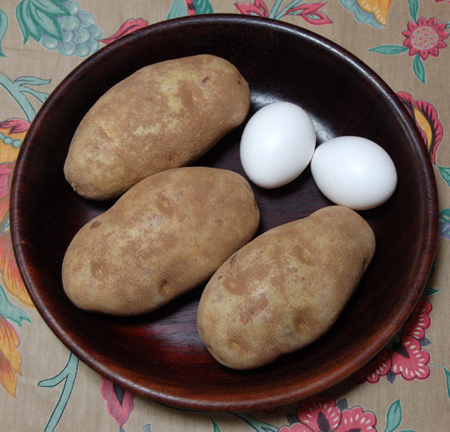 Boil the potatoes whole in lightly salted water until tender and easily pierced with a sharp knife - about 45 minutes. Drain. As soon as you can hold them (I suggest using a pot holder or kitchen mitt), peel them and put the flesh through a ricer into a bowl set on a scale - you should have about 1 3/4 pounds of riced potato. Place the potato onto a large wooden board. Sprinkle with the salt, then add eggs and 1 1/2 cups flour and, using a dough scraper and your hands, start mixing the ingredients together to form a soft dough. 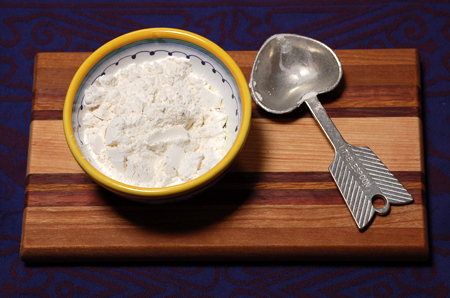 Continue to add the remaining flour as needed, kneading lightly as you go, until you have a dough that isn't sticky, feels satiny and, when pressed with a finger, springs back slightly yet leaves some of the indentation. Cover the dough with a dampened kitchen towel and let rest for 10-15 minutes. Pull off a small hunk of dough and re-cover the remaining dough with the towel. Gently roll the piece into a 3/4-inch "snake" as shows above. 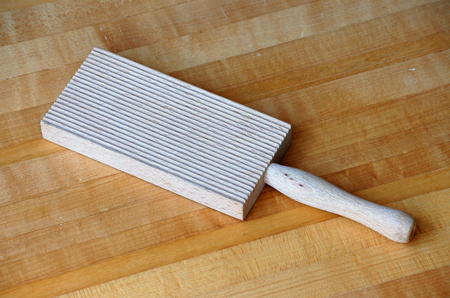 Using the dough scraper, cut the snake into 3/4-inch pieces. (Sometimes, I find it helps to roll the pieces into balls.) 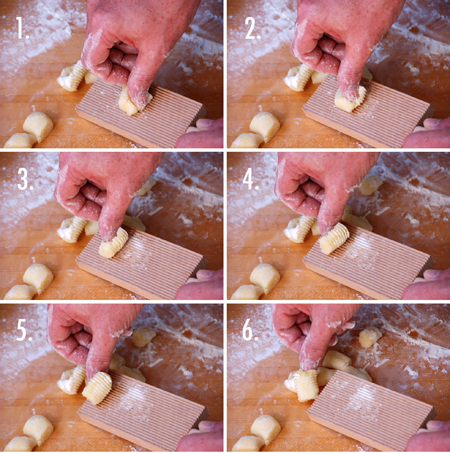 Using well floured hands (and continue to flour them as needed) and, using your thumb and forefinger, take a dumpling and roll it down the gnocchi board (or the tines of a dinner fork), pushing in with your thumb as you go to create a small hollow (as shown above). 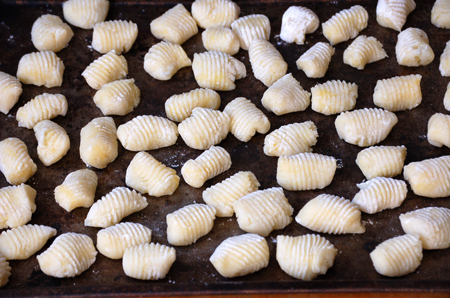 Place finished gnocchi on a baking sheet. If you are not planning to use them (or maybe not all of them) right away, freeze them on the baking sheet. When completely frozen, they will come off the sheet easily and can be stored in bags or other containers until needed. To cook the gnocchi, bring a large, wide pot of salted water to a boil. Cook gnocchi 10-15 at a time (if cooking frozen ones, cook fewer as not to lower the water temperature) and let them boil until they float. Remove them from the pan with a slotted spoon and place them in buttered (or oiled, depending on which sauce you want to use) baking dish, adding more butter or oil to them to prevent them for sticking. Place the baking dish in the oven to keep warm while you cook the others using the same method. When all gnocchi have been cooked, toss them with your favorite sauce - or simply butter and Parmigiano-Reggiano - and serve. Recipe makes approximately approximately 150 gnocchi. I use about 9-10 gnocchi for a first course serving. I've never made gnocchi before. Thanks for the detailed recipe and instructions David. Wow! David, this looks fantastic. I'll have to try this sometime. Hope you're doing well! Magda - it is definitely worth the "trial and error" to get these dumplings to your table! 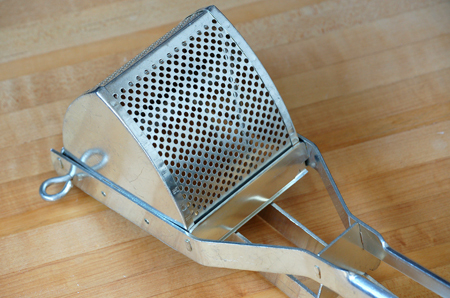 A for the gadgets, they all have multiple uses - the ricer is great for making the best mashed potatoes, and the gnocchi board is used in making several different types of fresh pasta. Tulika - all is well here! Today is the first (annual, we hope) cookie study break at Honors. Cookies (homemade by alumni, friends and staff) with hot cocoa and cider this afternoon to help fuel the studies for final exams! Wish you were here to bake, too! Definitely try the gnocchi - I know you like a good pesto and this is a nice combo! 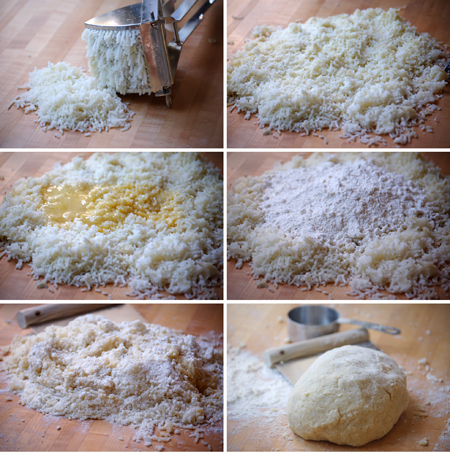 I LOVE gnocchi and I think I've had the same experiences over the years as you! Then I learned a little secret from my bookkeeper at the non-profit. Her grandfather's secret. Ready? Potato flakes! He used them instead of riced potatoes, eliminating the gummy texture. Light as clouds they were! Unfortunately, I lost the recipe a while back but you've inspired me to experiment and try to jog my memory! Egad! Potato flakes? Holy processed foods, Batman! :) Thanks, but I will stick with my ricer! It's just the purist in me! I would never be brave enough to try gnocchi. Your food photos are gorgeous (a good reflection of the food tastes, no doubt). Susan - You are brave enough to write novels. 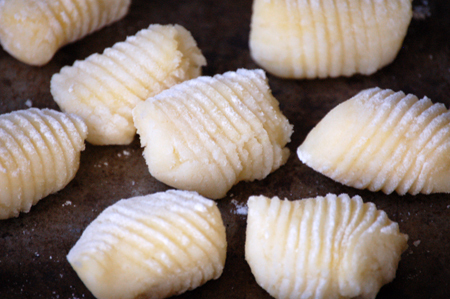 Gnocchi would be a cinch!